There is no federal mandate to address Black student’s specific need to receive education about their culture: a minority African – American culture that has been historically misconstrued through minstrelsy, attacked through mass media and largely ignored by school systems, except for the recent advent of ‘Black History Month.’ Consequently, African – American children are largely alienated from themselves, and hold a diminished view of their image, history and traditions. Reference the well-known Racial Identity and Preference psychological tests used to argue the 1954 Brown vs. Board of Education school desegregation case. 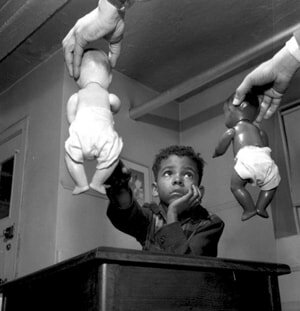 In the 1940s, psychologists Kenneth and Mamie Clark designed and conducted this series of experiments, popularly known as the “Doll Tests,” to study the psychological effects of segregation (read Black subjugation) on African-American children. They used four dolls, identical except for color, to test children’s racial perceptions. Their subjects, African – American children between the ages of three and seven, were asked to identify both the race of the dolls and which color doll they preferred. A majority of the children preferred the white doll and assigned positive characteristics to it. When asked to identify the doll that looked most like them, many of the children chose the white doll and many refused to answer, bursting into tears. The Clarks concluded that “prejudice, discrimination, and segregation” created a feeling of inferiority among African-American children and damaged their self-esteem. The test was conducted with Black American children recently in 2010 by CNN, and in 2012, with the same results. During the colonial period in Africa, and in the United States, educational institutions were tools of socialization to condition Black people to submit to the exploitative agendas of European colonial regimes. The result was what psychiatrist and writer Franz Fanon calls 'the colonized mind.’ African - American writer and Harlem native Walter Dean Myers shared his insight on this as it relates to his mid-twentieth century New York City public education in Bad Boy: A Memoir. Many African - American children are still being neglected in much the same way. They are taught, even if it is by omission, that their culture and history is not valuable and is insignificant. Chicago Educator Gregory Mitchie, in The Huffington Post article “On the Importance of Mirrors for Students (and Teachers)” points to a solution through culturally responsive education. He says that in schools “the curriculum should be both a “window” and a “mirror” for students.” He references educators Peggy McIntosh and Emily Style, who direct the National SEED Project (Seeking Educational Equity and Diversity): “the curriculum is a structure that ideally provides windows out into the experiences of others, as well as mirrors of the student’s own reality. In other words, schools should be spaces where kids explore the unfamiliar, but also see their own lived experiences validated and valued. For students whose racial, cultural, linguistic, or economic backgrounds differ significantly from that of the mainstream, the “mirrors” part of the metaphor can be particularly powerful.” These ‘mirrors’ are not only powerful, they are essential.